England vice captain Nobb’s speaks of her fustration at missing this Summers World Cup. 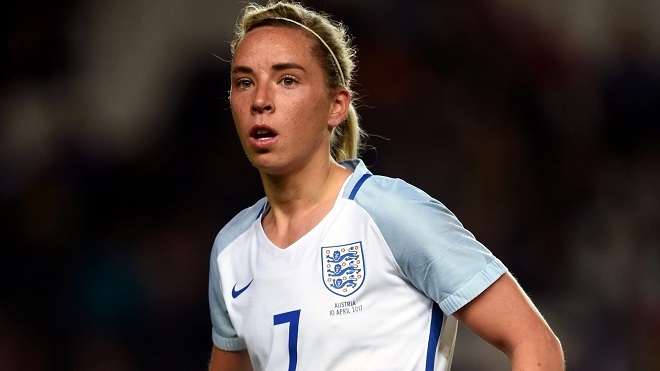 England’s Lionesses vice captain Jordan Nobbs as spoke of the heart ache and disappointment of missing her second World cup finals in succession after suffering a ruptured cruciate ligament injury during Arsenals 4-0 win over Everton Ladies in November. The midfielder who has 56 caps for her country and has been described by England boss Phil Neville as “invaluable” was quickly ruled out of returning in time for this summers World cup finals in France. “I went to press the ball and I felt like it bounced a bit funny and as I went to turn… I replay it in my head where my foot just didn't come with me, so obviously my knee has taken the hit. I knew straight away. The heart break is twice as hard for the talented 26 year old as she had previously missed out on playing in the 2015 tournament in Canada after suffering a torn hamstring only two weeks before the start, managing to make a cameo appearance in the sides 2-1 group win over Colombia. “I don't want to say it was torture being at the last World Cup, but being injured and being in that environment, in that bubble and you get to a semi-final… I wanted to do more than what I did there. Now two months into her nine month rehab Nobbs finished off by discussing where she is now and the mental toll the injury has taken on her since discovering the extent of the injury. “Some days I'm great; I'm ready for the fight,” she said. “Some days I walk in the gym and I want everyone else to leave; I want to be on my own. “You don't know what's going to happen. You have to accept that good days and bad days are all part of the experience, part of learning who you are as a player and as a person. “One thing I've learned, even after the last two months is don't take even the smallest things for granted, like walking to my car, trying to get in the car or being in the bathroom comfortably.